22" to top of finial; shade is 13.5" x 13.5" sq at widest. 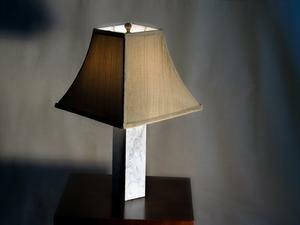 Marble bases are 3"w x 3"d x 10"h.
Lamps are in excellent vintage condition. The edges are sharp and the corners are crisp. The marble is vibrant, showing color and liveliness very similar to the Widdicomb square cocktail table we have with original carrerra marble. There is a small area of minor staining on one lamp that we have considerably highlighted and show here in two photos. Fittings are tight and secure, with secure felt bottoms. 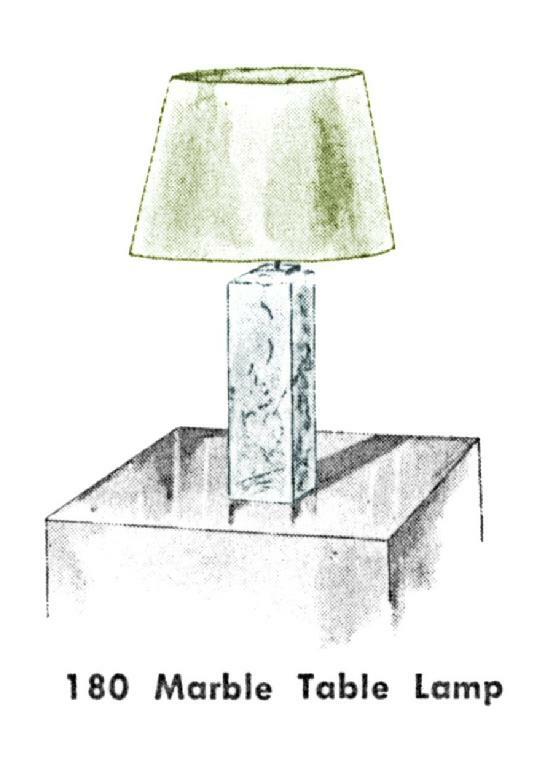 It is our curatorial observation that for at least some period of time, the lamps for this collection, as marketed by Widdicomb, were actually produced by Hansen, a highly reputable lamp maker and distributor, and were so marked on a low relief decorative brass fitting atop the marble column. This fitting appears to also be shown in the Widdicomb literature, as also illustrated here. Our lamps are unmarked. Shades are new, and are photo staging quality. We have lamped these fixtures, and used them lit throughout the photo process. These are wired with fixtures for "3-Way" lamp bulbs. As with all electrical devices sold by MassModern, we strongly urge you to have these items inspected by an electrical professional before use.